In our continuing series towards a list of World Rankings for 2008, it's time to determine what other countries should be included. The obvious ones so far are the sides that attended the 2008 Australian Football International Cup. What other nations could reasonably be expected to provide a squad of say 22 players under International Cup qualification rules? The players should be active players, having played in 2008, but not restricted to those that can travel - let's assume the dream situation that all expenses are paid or that any international matches are hosted locally. First of all let's note that we're still happy to take further comments regarding Spain/Catalan representation. We can consider EU Cup teams. The tournament is 9-a-side so less demanding in player numbers, but can act as a guide, in concert with information on the local clubs that contribute to those teams. But it would appear most would struggle to field full squads that would qualify, though many would go close. France and Germany appear to have reasonable numbers and could probably just manage enough all-local players to be included. Other countries with programs include Tonga, Norway, Czech Republic, Croatia, Indonesia, Solomon Islands, The Netherlands, Andorra, Austria, East Timor, Switzerland, Argentina and Chile. Did any of those have 22 active players in 2008 that would qualify? The Solomon Islands may, though they are playing non-contact Recreational Football. Indonesia have some juniors coming through, and possibly a few adults playing with the mostly Aussie Jakarta and Bali clubs. Argentina has at stages had a 4 team competition, but disappears off the radar so often that it is difficult to judge. What about the Asian clubs that are heavily expat-Australian based? For example Malaysia, Thailand, Vietnam, Laos and the Philippines. Have any of those developed enough local players to qualify? Doubtful. The same applies to the many new clubs sprouting in the Middle East in Dubai, Abu Dhabi etc. Perhaps all others should not be included until their numbers are more definite and they have competed more fully on the international stage? Happy to hear dissenting views. the list if you're going to include France and Germany. Fair enough - you've followed Europe more closely than me. Will be interesting when it comes to ranking them. Some info to back that up - approx. 100 germans played in the AFLG in 2008 among the 5 teams. Next year a sixth team will start in the league - the Stuttgart Emus, containing more locals. As stated in this article, we have fielded full 18-a-side teams over the past couple of years. The only problem we have is the money side of it. At this stage, we still lack a league sponsor and so travel costs are a killer. To play in the AFLG regular home-and-away season, players travel up to 5000km for the season. Hamburg to Munich is about 800km each way, requiring a two night stay - thats a big commitment for a lot of guys but the league is growing anyway. Unfortunately when it comes to international games, many of our top line players prioritise the AFLG season higher so cant spend the extra to get to the international games. A bit unfortunate for international footy, maybe, but it really just reflects on how keenly contested the AFLG is. Anyway, I reckon the Black Eagles deserve a mention in your rankings - so lets see where we end up! 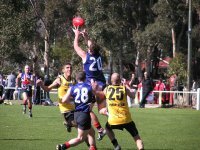 100 locals playing in 2008 - that's great to hear. Have no fear, Germany will be in there. Of course, with relatively strict criteria, a lot of the other new countries won't make the list at all, so Germany might be down the bottom of the list, even though they'd probably be higher than another 15 countries that won't be counted. We could go on for ever discussing the relative strengths of the various nations now playing Aussie Rules and any World Ranking based on whose point of view we consider is always a problem. Any ranking system must be based on actual performance and as the only series of matches that have been played with the same rules are the IC 's. But there have been many matches that have been played where both nations have accepted that the rules were such that they accepted the match as an 'International' or 'test'. I have applied an modified Rugby World Ranking system to many such matches and the IC's and come up with a ranking based on actual performance over time. It does have some differences to that shown in the IC's . I have tried to use only matches considered as 'Internationals' and ones where the bulk of players were nationals(where known) and avoided 9-a-side matches (where known), have accepted some (i think) 12-a-side 14-a-side and 15-a-side matches. Standings at end of 2009 playing season is: not including Australia. 1. Denmark. 55.77 ranking points Played most matches. Little or no evidence for other nations in World Footy News or The Footy Record to support inclusion to ranking scheme. I have replaced 15pt win bonus of Rugby World Ranking with 40pts win bonus. I have stuck with IC bonus as in Rugby World Cupto give it it level of importance and player qualifying rules their due. If Footy World News was to publish a Ranking similar and set some qualifying rules/standards for inclusion of matches to the ranking scheme then I believe it would encourage all nations to play their 'Internationals' under those standards and then a better and more accurate World Ranking would evolve encouraging nations like many in Asia to include more nationals and fewer expats (even tho I believe there is a place for expats in national teams as long as they have lived(say no less than 5 years) in their new country for an agreed upon qualifying time, some thing the new EAFE might come up with). I am only to pleased to share my calculations with all so that you are able to see which matches I have include and am willing to make changes if he evidence can be supported to make the ranking scheme more accurate based on matches played. I am sure that some matches might not really qualify and others left out that should be included. Regardless what rugby or any other professional sport do, these rankings are on a different planet to the actual relative strengths of the national teams in Australian rules out there. Denmark would not come within 100 points of PNG or NZ. Also, you've got Norway in there, who have only played one international, and not under IC rules, yet they're above people who've played games with a full squad of all locals. Cam, having another look at your rankings, I think the problem with your formula is just that they go back too far. E.g. South Africa, who are realistically top 5 at the current point in time, are a long way down the list - presumably because they got flogged in every game at the IC02 when they were at a very early stage of development. How would the table look if you just crunch the numbers going back to, say, the 2005 IC? Thanks for your efforts there Cam - obviously a lot of time has gone into it. We did canvas a lot of the issues you discuss but I guess we came to the opposite conclusion. You're saying a list must be based on fixed tight applied criteria and results leading to very few games counting, and it comes up with a list that doesn't really indicate where countries stand, but offers the hope that it pushes them to play games under the rules established by the list. But in the short to medium term they just won't do that. Many prefer or can only play 9s, and extending to include matches older than 2 or 3 years doesn't really have much meaning, and you do have to be very careful which games get included - a team named as a national side might not be widely recognised as such and may not be as strong. So we decided that the only practical solution was to set a more generous criteria, but then more rigorously make sure it was met before including a game, and then given the sparse nature of the data, make sensible extrapolations. Then with all that in our heads, have a vote amongst our staff who follow the scene fairly closely. To me, it's the most exhaustive and realistic list. We don't claim it to be official - none exists and can't really because of the reasons you list and all the issues we discussed in the stories leading up to the final results. But I reckon ours serves as a pretty reasonable unofficial guide. If someone says, who are the best countries in the world, pointing them at our list will answer their question. Since this has been raised, and given the sparse data for 2009, would people like to see an end of 2009 list or should we let 2008 remain through until the end of 2010, and await IC2011 for an update? Thanks Aaron and Brett for your comments regarding World Rankings. PNG 69 - 23 Denmark IC 2002. Rankings based on actual games played give a truer picture than those based on conjecture eg. Denmark would not come within 100 points of PNG or NZ. I agree, the paupacity of matches played is the real problem but we have to start somewhere. If we cut out matches played in the past then we have even fewer games to consider (I have included 30 matches for Denmark, only 23 for New Zealand including games from the Arafura Games) Yes, Norway and Czech Republic were included just to push up the number of teams in the list. (I don't no if they were not 9-a-side games anyway) The Rugby World Ranking(RWR )scheme has teams that have played less than 20 matches only on probation (I have ignored that qualification as it would rule out all but a hand full of countries and as all teams start on 40 ranking pts. a team with only a couple of winning matches to their name are going to rank higher than a long term loser like Japan ( I've included some Arafura games losses by Japan as well as IC losses). A ranking scheme based only on the last few games played by any given team does not rule out 'freak' or 'upset' results from scewing the rankings. Geelong flogging Port Adelaide in a grand final a couple of years ago doesn't make them rank any lower than 2nd that year even tho all non Port Adelaide supporters would like to think so(me included). The point of my suggestion is that as there is no official ranking scheme and altho I think your rankings were probably pretty spot on, there is little empirical data to actually support it. A scheme where the ranking is actually based on matches played and having some history built into it will rule out arguement from those who may think they should be further up the rankings. A separate 9-a-side Ranking scheme would over come those nations not yet able to be field teams under or near IC conditions. I thought I would try to write myself a program before I attempted to rank all those extra nations and matches in a 9-a-Side World Ranking. And Brett regarding your last point if such a ranking scheme with ranking points is up and running then each match that was played since 2008 could be easily added and the upcoming European championships this year could be added as they are played. Also the nations could actually go back into an archive and see what their ranking was say in August 2006. (eg NZ #1 with 53.32 Ranking points) It could be an Official Unofficial World Ranking in the absence of an Official Official World Ranking. Aaron I will crunch the numbers using only data from IC 2002 and IC 2005 on and see what that looks like, but give me a bit of time to do that. Again I can share the data that I have used to determine my Rankings and I would only too gladly make necessary changes where the evidence rules out a match or even rules in a match. About 13 pages of Excel. Hope to see more comments from you guys and others soon. Firstly I want to own up that I love statistics. So I like the effort and idea behind what you've done. But I reckon a scientist/statistician/whatever sometimes has to accept that there just isn't enough data. In terms of Denmark not getting within 100 of NZ or PNG (Aaron's comment), which I think you are disputing by referencing 2002 results, that's kind of the point. The nature of international footy is that it's changing pretty quickly, so 2002 and even 2005 is far too outdated to include. Would you rank AFL teams for 2009 or 2010 based on 2002 results? And actually, you mention in 2008 SA def Denmark by 45. Well PNG def SA by 47 in the same tournament. So that's 92 points between PNG to SA to Denmark, so Aaron's comment is pretty reasonable. And one and half years on I'd expect PNG will have improved even further. Really, I think given the 3 year cycle of International Cups, when the vast majority of full scale matches with the majority of players available are played, a measure really needs to just include from the last Cup to the present, so say 2008 onwards. If that means insufficient data to be meaningful, adding out of date data won't help. "The point of my suggestion is that as there is no official ranking scheme and altho I think your rankings were probably pretty spot on, there is little empirical data to actually support it". Not quite right. Although the data hasn't been putting into an explicit mathematical formula, the starting point for our last rankings was the finishing positions at the end of IC08, so the starting point was a real ranking resulting from all the games played at that tournament. And as we detailed in the series of stories leading up to the rankings, we took into account subsequent matches like the EU Cup when teams were roughly representative of their country's best locals and discount some teams which were from limited areas or mainly expats, so we were careful to use just the appropriate results and that required talking to people at the time. So really what we're looking at is a complicated algorithm that has to factor in matches but weight against them quite strongly as they drift into history, which discounts other matches if the teams were not truly representative of their countries, include those that are, and consider any other special circumstances. Sorry, I'm not persuaded yet. And if you agree with our results as being "probably spot on", then your algorithm has to at least get close before being a valid alternative doesn't it? Would be happy to see your results just including 2008 onwards, and listing what games were included. Forever only looking at the last half dozen or so games played will not bring about a ranking that can be tested. It will always be open to dispute eg. our team has been training hard getting expert coaching we didn't have before when the next game is played we're gunna be much better and move up the rankings!!! we might have 20 experts agree with that statement BUT that can only be tested after that next match. win = rise up rankings, star player breaks leg goal kickers have crap day kick 1 - 10 instead of 10 -1. 20 experts proved wrong. Take a look at the Rugby Rankings and their assumptions at IRB World Rankings - explanations - Probably more succinct than I can ever be. And I keep coming back to the paupacity of matches played internationally in Aussie Rules is our problem and that we must start some where and if we keep ruling out games because they were played more than 4- 5 -10 years ago and by using them they might not agree with how we think the standard of play is improving in this country or that country then we will never accumulate enough matches to ever be able to rank the countries with an empirical ranking scheme. Again as the AFL are totally unlikely to set one up and you do set up an unofficial official ranking scheme it just might prompt the AFL to do so, as we all know the AFL doesn't like other organisations doing AFL things without them having their finger in the pie, especially if it looks like it might be successful. I understand your point that some kind of mathematical system might encourage teams to compete more or the AFL to do their own system, but I think it's unlikely to make much difference in either case - countries already like to compete, it's costs and player availability that hold them back quite often. And the AFL didn't jump to implement a system in response to ours. I think they recognise that there isn't enough data. So I can see the motivation but I just can't agree with a system if it produces a completely invalid result. I guess we agree to disagree - you reckon lack of data means include data that is old to at least get a result, I reckon it's just including bad data to give bad results. Cam again on World Rankings. First to you Aaron, I said I'd do a ranking just using IC resultsbut when I began doing that I discovered I had made a fundamental error in the calculations using the modified Rugby World rankings system, which really scewed teams winning home games. If you remember that all teams start on 40 ranking pts and Peace Team and China did get a win each in the IC 2008 is the reason they rank higher than teams that have a lot more games included in their score. Fewer people would have been surprised to see Ireland win IC 02 if the ranking scheme was in place back then. New Zealand was probably lower here than should have been but their ranking was based on few games with loses against PNG at the Arafura games. All of the above are not too far off the mark when compared to the ranks determined by the IC results. Advantage is that each country has a ranking value based on games actually played. Disadvantage at present is the fact that some ranks are based only on a handful of matches. IRB ranking scheme only allows country full entry to ranking after 20 matches. Remember also that I can't vouch for every match used is truly at near IC rules. Hope you spend some minutes looking at these results and may they help you begin to shift your thinking towards a similar scheme. It will be interesting to see what all the ranking methods/schemes look like after the up and coming European Championships. Glad to see you found your mistake. The numbers look much more sensible now. Can you summarise how the scheme works in just a few dot points? What they start with, how much for a win/loss/draw, is the ranking of the opposition taken into account? Good work Cam, those figures look fairly close to the mark. If it's feasible and you can help us do it, maybe we should be looking at doing this? I'll shoot you an email. The IRB World Rankings use a 'Points Exchange' system in which sides take points off each other based on the match result. Whatever one side the gains the other side loses. The points exchanges are based on the match result, the relative strength of each team, and the margin of victory. There is also an allowance for home advantage. Points Exchanges are Doubled in World Cup Final Matches, I did same the for all IC Matches. Margin of Victory bonus is given for wins over 15 points in IRB but I allocated the bonus for wins over 40 Points as Aussie rules matches tend to have much higher final scores than Rugby Union. You might decide that a 50 point win might be more deserving than a 40 point win. The maximum Points exchange is limited to 2 Points. This rules out teams like New Zealand gain huge exchange points for beating India by 229 -0 in IC 08. This rules out freak results and makes sure the sytem doesn't over react. An example at how it works :- lets take Denmark and Great Britain at the end of IC02. they were Denmark 5th with 41.60 and Great Britain 8th with 36.61 ranking points. These teams then played one of their fairly regular internationals in July 03. in Denmark. but Denmark beat GB 12.13(85) to 4-5(29) a margin of 56 points so the margin of victory bonus comes into play. The bonus is the exchange points x 1.5. Denmark 0.201 x 1.5 = 0.302 Final exchange points. GB - 0.302 x 1.5 = -0.032 Final exchange points. which still have them at 5th and 8th respectively. This is why the IRB only allows full ranking after a substantial number of games are played. We could include teams with say less than 5 matches in the ranking but as provisional only. If you actually have a look at the "IRB World Ranking" website and then find and click on 'explanation ' and all the explanation and the reasoning on how why it is designed is there explained much better than I can hope to do. The system is designed to produce an accurate picture of current strength, based on results. The importance of past sucesses will fade and be superseded by more recent results. I hope the examples above helps you understanding and how I have adapted the IRB scheme. I can be emailed at 'flinderscycles@internode.on.net' and if you can supply me with an email address I can email all of my calculations so you can see which matches I have used to get the ranking as it stands at end of 09 playing season. Ireland actually gets no advance by beating a team so far below it and Canada loses nothing by getting done by a team so far above it. Ireland 45.24 - 2.00 = 43.24 ranking points and slips below Canada on 43.63 and Denmark on 43.53 ranking points. up and coming European Championships are played out between teams already ranked. If the likes of France, Croatia and Catalonia play against teams already ranked first up then because they are given 40 points to start they may still be ranked higher than already ranked teams until they play a few games and lose some points. Hi Guys Cam Again jeeesssss not again!!! Japan 35.01 - 0.80 = 34.21 and stays 15th. The system allows us to have a Ranking with ranking points for each country at the end of every month since July 1994. Of course I again reiterate that I can't vouch for every match that I've used and I believe some rules would have to be stated eg. Matches before IC 02 at least 12-a-side and and more than 8 locals. Matches after IC 02 at least 14 or 16-a-side and more than 12 locals or something similar. IC 's as they are with stricter rules but the bonuses included in the scheme stamps the importance of the IC's. Just letting people know that we've been chatting to Cam offline over the last few days to explore using this system. Hey Cam, as discussed by email, I've had a read of the IRB model and think I follow it okay and that has allayed some of my concerns. Of course the numbers have to be crunched correctly. IC08 Clasification rounds USA 14.12(96) d Japan 2.4(16) USA is 6th with 43.14 ranking points Japan is 15th with 35.01 ranking points No home Advantage so Rating Gap is USA -7.33 and Japan is 7.33 maths for exchange points is USA -7.33/10+1= 0.267x1.5(40plus bonus) =0.400 x 2(IC bonus) =0.800 Japan 7.33/10-1= - 0.267x1.5( " ") = - 0.400x 2 = -.800 so end of IC08 USA 42.34 + 0.80 = 53.14 ranking points and climbs to 5th place Japan 35.01 - 0.80 = 34.21 and stays 15th. So a small step up for the US, no surprise since they were already ranked ahead of Japan. 1. Including too much history - no, that is okay, as it sets the rankings but they then adjust as new data arrives, steadily washing out old results. 2. Points exchanged the same for a top team defeating a lower team as vice versa - no, a top team gains less points than the lower team would for a win. The top team on the other can lose whatever the lower team can gain. 3. Initial teams ranked too high - no, although they get 40 points, they are provisional only, used in the number crunching, but not displayed/ranked until a certain number of games to qualify. 4. Teams rewarded for playing often - no, they risk losing just as much as they can gain, unless they systematically keep playing lower sides over and over to very slowly increase their total. So overall, looks like a pretty reasonable system. Let's keep discussing offline how we might test it and trial it. A couple of typos there, wrote down wrong numbers to start with I think so calculation looked a bit silly in the end. But I think you got the point and you obviously have understood how it works and as you say the actual maths is simple and were able to correct me.